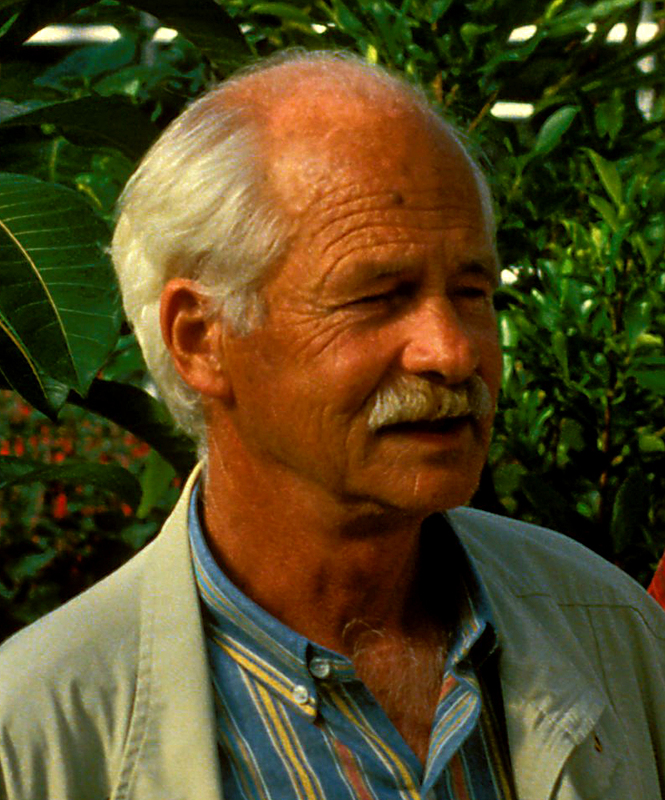 Kees Berg in the Norwegian arboretum hothouse during the 1994 Bergen conference. 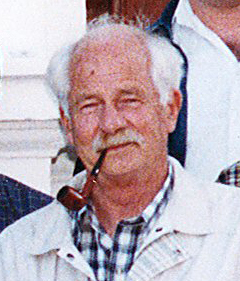 Kees in characteristic pose with his pipe at the Cape Town conference in 2000. 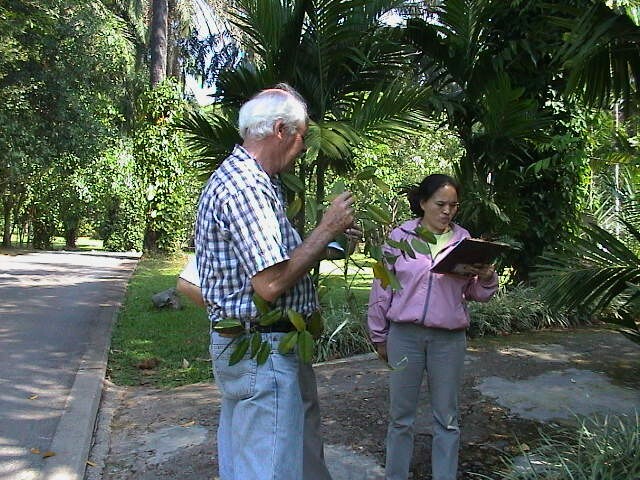 Visit to Xishuangbanna Tropical Gardens in 2002 (Photos courtesy of Yan-Qiong Peng). 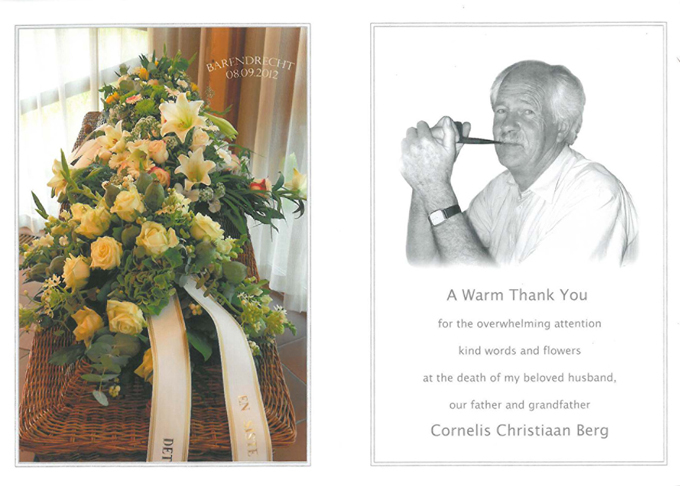 BERG, Cornelis Christiaan; born in Bandung (Indonesia) 02.07.1934; Dutch citizen, married. Education (in the Netherlands): school for horticulture at Breda; University of Utrecht, biology: candidate 1962, doctoral 1964, ph.d. 1973 (Thesis "Studies in Moraceae", including Flora Neotropica Monograph 7, 1972, New York). Research: Studies on polyploid complexes in Cardamine and Mysosotis. These subjects were left in favour of the study on and a gradual specialization in the taxonomy, systematics, phytogeography of Moraceae and Cecropiaceae (separated from Moraceae, Berg, 1977). In some cases the related families Ulmaceae and Urticaceae are also attended to and for some genera (Cecropia and Ficus) the work is linked to plant-animal interactions. The studies on these plant familes started with revisions with some Neotropical tribes of Moraceae (thesis subject) and a treatment of Moraceae (incl. Cecropiaceae) for the Flora of Surinam (in co-operation with Dr. DeWolf, Cambridge, U.S.A.). Although work on Neotropical members of the plant groups continued, studies on African Moraceae and Cecropiaceae drew for a long period my attention and resulted in numerous publications, as several flora treatments (for Cameroun, East Africa, Gabon, southern tropical Africa, and Togo), partly carried out in co-operation with my students. For several years these studies have been linked to the French CNRS-ECOTROP program on interactions between Ficus and fig insects, which resulted in a book on African fig trees and fig wasps (Berg & Wiebes, 1992). After having largely finished involvement in the African flora, more time has been spent on Neotropical Moraceae and Cecropiaceae, including three monographic studies and several flora treatments. Moreover, studies on Asian Moraceae, in particular in behalf of Flora Malesiana (now published) and the Flora of Thailand (now edited), became part of my Research program. One of the aims for the involvement in studies on Moraceae of the two Asian flora projects (and planned extensions to other parts of Asia and to Oceania) was and is to get an intimate knowledge of the genus Ficus worldwide in order to propose a more satisfactory classification than existing ones as in behalf of a better understanding of the evolutionary aspects of the Ficus - fig insect interactions. The taxonomic work is currently linked to molecular studies carrried out in Kew and St. Paul (Minnesota) by Dr. N. Rønsted, who has already published several papers on this subject. Co-operation with starting or established Researchers in countries or areas to which the (flora) projects are linked ihave been promoted and often realized. Publications: currently more than 140 scientific publications have been produced, nearly all of them on the families indicated or the order Urticales in general. They comprise 4 authored books, 11 co-authored books, ca. 80 papers in refereed journals, ca. 20 papers in non-refereed journals. About 20 contributions (most of them to various floras) have been submitted, some not yet even reviewed. Fieldwork: in course of time fieldwork, varying from periods of just a few days (mostly in conjunction with meetings) up to five months have been carried out in Africa (Cameroun, Ivory Coast, Malawi, Nigeria, South Africa, Zambia, and Zimbabwe), America (Brasil, Bolivia, Colombia, Costa Rica, Ecuador, French Guiana, Honduras, Jamaica, Panama, Peru, Puerto Rico, Surinam, Trinidad, and Venezuela), and Asia (southern China, Thailand), mainly in behalf of the studies on Moraceae and Cecropiaceae, but also several general botanical expeditions. Teaching: various courses on plants morphology, plant systematics, and plant-animal relations, and field courses in regular university curricula (at Bergen and Utrecht) and in a part-time education and training program for teachers in biology (at Utrecht). Member of committees to evaluate Ph.D theses (e.g., in Montpellier in 1999, 2004). Meetings: participation in national and international botanical congresses and symposia, with about 25 oral presentations, and participation in (board) meetings of the (UNESCO) Organization of Flora Neotropica, etc. 1.Berg, C.C. & S. Segal 1966. De Pinksterbloem in Nederland. Gorteria 3: 77‑86. 2.Berg, C.C. 1967. Cytotaxonomic studies in Cardamine pratensis L. in the Netherlands. Acta Bot. Neerl. 15: 683‑689. 3.Berg, C.C. 1968. Taxonomic and morphological notes on Clarisia (Morac.). Acta Bot. Neerl. 17: 309‑312. 4.Berg, C.C. 1968. Proposal to add Ferolia to the names tobe rejected against 1957. Brosimum Swartz nom. cons. Taxon17: 731. 1968. 5.Berg, C.C. 1969. New taxa and combinations in the Neotropical Olmedieae. Acta Bot. Neerl. 18: 462‑465. 6.Berg, C.C. 1970. New taxa and combinations in the genus Brosimum (Morac.). Acta Bot. Neerl. 19: 326‑328. 1970. 7.Berg, C.C. 1972. A new species in Helianthostylis (Moraceae). Acta Bot. Neerl. 21: 99‑101. 8.Berg, C.C. 1972. Flora Neotropica Monograph No. 7.Olmedieae and Brosimeae (Moraceae). 228 pp. New York. (Reprint 1985). 9.Berg, C.C. 1972. A new species of Cecropia (Moraceae).Acta Bot. Neerl. 21: 655‑656. 10. Berg, C.C. & R.C. Kaastra. 1973. Myosotis palustris en M. laxa in Nederland. Gorteria 6: 141‑150. 11. Berg, C.C. 1973. Some remarks on the classification and differentiation of Moraceae.Meded. Bot. Mus. Herb.Rijksuniv. Utrecht No. 386. 10 pp. 12. Berg, C.C. & G.P. DeWolf 1975. Moraceae. In J. Lanjouw &A.L. Stoffers. Flora of Suriname. Vol. 5 (1): 173‑299.Leiden. 13. Berg, C.C. & M.E.E. Hijman 1977. A precursor to the treatment of Dorstenia for the Floras of Cameroun and Gabon. Adansonia, Sér. 2, 16: 415‑443. 14. Berg, C.C. 1977. The Castilleae, a tribe of the Moraceae, renamed and redefined due to the exclusion of the typegenus Olmedia from the "Olmedieae". Acta Bot. Neerl. 26:73‑82. 15. Berg, C.C. 1977. Abscission of anthers in Cecropia Loefl. Acta Bot. Neerl. 26: 417‑419. 16. Berg, C.C. 1977. Cecropia purpurascens, a new species ofBrazilian Amazonia. Acta Amazonica 7: 185‑188. 17. Berg, C.C. 1977. Urticales, their differentiation and systematic position. In K. Kubitzki (ed. ), Floweringplants ‑ Evolution and Classification of higher categories. Plant Syst. Evol., Suppl. 1: 349‑374. 18. Berg, C.C. 1977. Revisions of African Moraceae (excl. Dorstenia, Ficus, Musanga and Myrianthus). Bull. Jard.Bot. Natl. Belg. 47: 267‑407. 19. Berg, C.C. 1978. Revision of Dorstenia sect.Nothodorstenia (Moraceae). Bot. Notiser 131: 53‑66. 20. Berg, C.C. 1978. Cecropiaceae a new family of the Urticales. Taxon 27: 39‑44. 21. Berg, C.C. 1978. New Amazonian species: Coussapoa prancei and Perebea mennegae (Moraceae). Acta Bot. Neerl. 27: 11‑15. 22. Berg, C.C., E.A. Mennega & J. Tolsma. 1978. A new species of Peperomia (Piperaceae). Acta Bot. Neerl. 27: 79‑81. 23. Berg, C.C. 1978. Espécies de Cecropia da Amazônia Brasileira. Acta Amazonica 8: 149‑182. 24. Berg, C.C. 1978. Notulae: Revisions of African Moraceae (excl. Dorstenia, Ficus, Musanga and Myrianthus): corrections and additions. Bull. Jard. Bot. Natl. Belg. 48: 466‑468. 25. Berg, C.C. 1980. Three new African Ficus species and acomment on Ficus gnaphalocarpa (Moraceae). Adansonia, Sér.2, 20(3): 263‑272. 26. Berg, C.C. 1980. Moraceae. In A.L. Stoffers (ed.). Floraof the Netherlands Antilles 2: 111‑120. Utrecht. 27. Berg, C.C. 1981. A new species of Ficus (Moraceae) from Costa Rica. Acta Bot. Neerl. 30(3): 231-233. 28. Berg, C.C. & E. Simonis 1981. The Ficus flora ofVenezuela: Five species complexes discussed and two new species described. Ernstia 6: 1‑12. 29. Berg, C.C. 1981. An exceptional new species of Cecropia (Moraceae) from Ecuador.Nordic. J. Bot. 1: 485-487. 30. Berg, C.C. 1981. The reinstatement of the West AfricanFicus lutea Vahl (Moraceae). Kew Bull. 36(3): 597‑598. 31. Berg, C.C. 1982. The reinstatement of the genus Milicia Sim (Moraceae). Bull. Jard. Bot. Natl. Belg. 52: 225‑229. 32. Berg, C.C. & R.W.J. van Leeuwen 1982. The Dorstenia species (Moraceae) of north‑western tropical America. Proc. Kon. Ned. Akad. Wetensch., Ser. C, 85(1): 29‑39. 33. Berg, C.C. & F. Kooy 1982. Three new species of Pourouma(Cecropiaceae) of the Guiana region. Brittonia 33: 36‑41. 34. Akkermans R.W.A.P. & C.C. Berg 1982. New species andcombinations in Coussapoa (Cecropiaceae) and keys to itsspecies. Proc. Kon. Akad. Wetensch., Ser. C, 85(4): 441‑471. 35. Berg, C.C. & E.C.H. van Heusden 1982. Moraceae. In Floraof Trinidad and Tobago 2(9): 722‑749. Port of Spain. Suriname. Acta Bot. Neerl. 32(3): 223‑226. 37. Berg, C.C. 1983. A new species of Coussapoa (Cecropiaceae)from Peru. Proc. Kon. Akad. Wetensch., Ser. C, 86(3): 305-307. 38. Berg, C.C. 1983. Dispersal and distribution in Urticales ‑an outline. In K. Kubitzki (ed. ), Dispersal and Distribution. Sonderbd. Naturwiss. Ver. Hamburg 7:219‑229. 39. Berg, C.C., M.E.E. Hijman & J.A.C. Weerdenburg 1984. Floredu Gabon 26. Moracées. pp. 276. Paris. 40. Berg, C.C. 1984. Moraceae. In J.F. Brunel, P. Hiepko & H. Scholz (eds.). Flore analytique du Togo (Englera 4):355‑366. 41. Floral differentiation and dioecism in Ficus (Moraceae). In F. Kjellberg & G. Valdeyron (eds.) Mini symposium: Figs and fig insects: 15‑28. CNRS‑Centre Louis Emberger, Montpellier. 1984. 42. Berg, C.C.1984. Differentiation of fruitlets of Ficus,especially of subg. Urostigma sect. Galoglychia. Mini symposium: Figs and fig insects 29‑33. CNRS‑Centre LouisEmberger, Montpellier. 43. Michaloud, G., S. Michaloud‑Pelletier, J.T. Wiebes & C.C. Berg 1985. The co‑occurrence of two pollinating species offig wasp and one species of fig. Proc. Kon. Ned. Akad.Wetensch., Ser. C, 88(1): 93‑119. 44. Berg, C.C. & J.P.P. Carauta 1985. Two new species ofDorstenia (Moraceae) from East Brazil. Proc. Kon. Ned.Akad. Wetensch., Ser. C, 88(3): 261‑265. 45. Berg, C.C. & R.W.A.P. Akkermans 1985. Studies on the Floraof the Guianas 14. New taxa and combinations in Sorocea (Moraceae) and a key to its species. Proc. Kon. Ned. Akad.Wetensch., Ser. C, 88(4): 381‑394. 46. Berg, C.C. 1985. Studies on the Flora of the Guianas 15.A new species of Cecropia (Cecropiaceae) from FrenchGuiana. Bull. Mus. Natl. Hist. Nat. Paris, Sér. 4, 7(Sect. B, Adansonia No. 3): 255‑258. 47. Berg, C.C. 1985. Studies on the Flora of the Guianas 16.A new species of Pilea (Urticaceae) from French Guiana. Bull. Mus. Natl. Hist. Nat. Paris, Sér. 4, 7 (sect. B,Adansonia No. 4): 429‑431. 48. Berg, C.C., M.E.E. Hijman & J.A.C. Weerdenburg 1985. Floredu Cameroun 28. Moracées (incl. Cecropiacées). pp. 298. Yaoundé. 49. Berg, C.C. & E.C.H. van Heusden 1985. Flore des Mascareignes, Fam. 164 (Moracées). pp. 21. Port Louis,Mauritius. 50. Berg, C.C. 1986. The Ficus species (Moraceae) ofMadagascar and the Comoro Islands. Bull. Mus. Natl. Hist. Nat. Paris, Sér. 4, 8 (Sect. B, Adansonia No. 1): 17‑55. 51. Berg, C.C. & J.P.P. Carauta. 1986. Cecropia (Cecropiaceae)no Brasil ao Sul daBacia Amazônica. Albertoa 1(1): 3‑12. (Reprint 1996). 52. Vázquez Avila, M., C.C. Berg & F. Kooy 1986. New taxa ofSouth American Ficus. (Studies on the Flora of the Guianas17). Acta Amazonica 14(1/2), Supl. (Contribuiçoes doProjecto Flora Amazônica 7): 195‑213. 53. Berg, C.C., M. Vázquez Avila & F. Kooy 1986. Ficus speciesof Brazilian Amazonia and the Guianas. (Studies on theFlora of the Guianas 18). Acta Amazonica 14(1/2), Supl. (Contribuições do Projecto Flora Amazônica 7): 159‑194. 54. Berg, C.C. 1986. Subdivisions of Ficus subg. Urostigmasect. Galoglychia (Moraceae). Proc. Kon. Ned. Akad. Wetensch., Ser. C, 89(2): 121‑127. 55. Berg, C.C. & T. Wendt 1986. A new species of Dorstenia(Moraceae) from Mexico. Proc. Kon. Ned. Akad. Wetensch.,Ser. C, 89(2): 129‑132. 56. Berg, C.C. 1986. Studies on the Flora of the Guianas 20. The Dorstenia species (Moraceae) of south‑eastern tropicalAmerica. Proc. Kon. Ned. Akad. Wetensch., Ser. C, 89(2):133‑146. 57. Hollander, D. den & C.C. Berg 1986. Studies on the Flora of the Guianas 21. Mabea species (Euphorbiaceae) of the Guianas ‑ a precursor. Proc. Kon. Ned. Akad. Wetensch., Ser. C, 89(2): 147‑157. 58. Berg, C.C. 1986. The delimitation and subdivision of the genus Maclura (Moraceae). Proc. Kon. Ned. Akad. Wetensch., Ser. C, 89(3): 241‑247. 59. Berg, C.C. 1988. New taxa and combinations in Ficus (Moraceae) of Africa. Kew Bull. 43(1): 77‑97. 60. Berg, C.C. & E.C.H. van Heusden 1988. New taxa andcombinations in Pourouma (Cecropiaceae). Proc. Kon. Ned.Akad. Wetensch., Ser. C, 91(2): 105‑116. 61. Berg, C.C. 1988. The genera Trophis and Streblus(Moraceae) remodelled. Proc. Kon. Ned. Akad. Wetensch., Ser. C, 91(4): 345‑362. 62. Berg, C.C. & M.E.E. Hijman 1989. Moraceae and Cecropiaceae. In R.M. Polhill (ed.). Flora of TropicalEast Africa. 95 pp. Rotterdam/Brookfield. 63. Berg, C.C. 1989. Classification and distribution of Ficus.In: Comparative biology of figs. Experientia 45: 605‑611. of the Hamamelidae. Vol. 2. 'Higher' Hamamelidae: 193‑220.Oxford. 65. Berg, C.C. 1989. Pourouma herrerensis C. C. Berg, a new species of Cecropiaceae from Amazonian Peru. Contribution to the study of flora and vegetation of Peruvian Amazonia.XV. Candollea 44(2): 513‑516. 66. Berg, C.C. 1990. New species of Coussapoa and Pourouma. Brittonia 42: 59‑65. 67. Berg, C.C., R.W.A.P. Akkermans & E.C.H. van Heusden 1990. Flora Neotropica Monograph No. 51: Cecropiaceae: Coussapoaand Pourouma, with an introduction to the family. pp. 208, New York. 68. Berg, C.C. 1990. Annotated check‑list of Ficus species of the African floristic region, with special reference and akey to the taxa of Southern Africa. Kirkia 13(2): 253‑291. 69. Berg, C.C. 1990. Distribution of African taxa of Ficus(Moraceae). Mitt. Inst. Allg. Bot. Hamburg 23a: 401-405. 70. Berg, C.C. 1990. Reproduction and Evolution in Ficus(Moraceae): Traits connected with the adequate rearing of pollinators. In G.K. Gottsberger & G.T. Prance (eds. ),Reproductive biology and evolution of tropical woodyAngiosperms. Mem. New York Bot. Garden 55: 169‑185. 71. Berg, C.C., 1990. Differentiation of flowers andinflorescences of Urticales in relation to theirprotection against breeding insects and to pollination.Sommerfeltia 11: 13-34. 72. Berg C.C. & M.E.E. Hijman 1991. Moraceae and Cecropiaceae.In E. Launert & G.V. Pope (eds. ), Flora Zambesiaca 9(6):13-78. London. 73. Berg, C.C. 1992. Ulmaceae, Moraceae, Cecropiaceae,Urticaceae, and Casuarinaceae. In A.R.A. Görts-van Rijn (ed. ), Flora of the Guianas Ser. A., Fasc. 11. pp. 222. (Wood and Timber (pp. 141-191) by B.J.H. ter Welle, K. Bonsen & P. Detienne). Koenigstein. 74. Berg, C.C. & J.T. Wiebes 1992. African fig trees and figwasps. pp. 298. Amsterdam/Oxford/New York/Tokyo. 75. Berg, C.C, 1992. Cecropiaceae, Moraceae, Ulmaceae and Urticaceae. In J. Bogan, V, Funk, C. Kelloff, M. Hoff., G.Cremers & C. Feuillet (eds. ), Checklist of Plants of theGuianas (Guyana, Surinam, French Guiana). Georgetown, Guyana. 76. Berg, C.C. & P. Franco Rosselli 1993. Cecropiaceae. In G. Harling & L. Andersson (eds. ), Flora of Ecuador 27A. pp.109. Arlöv. 77. Berg, C.C. 1996. Moraceae Guineae Aequatorialis nonnullae.Fontqueria 44: 93-105. 78. Berg, C.C. & P. Franco Rosselli 1996. New taxa andcombinations in Moraceae and Cecropiaceae from Central andSouth America. Novon 6: 230-252. 79. Compton, S.G., J.T. Wiebes & C.C. Berg 1996. The biology of fig trees and their associated animals. J. Biogeography23: 405-407: Introduction to a volume with contributionspresented at a symposium held in Bergen, May 1994. 80. Berg, C.C. 1997. Cecropiaceae, Moraceae, Ulmaceae, andUrticaceae. In J. Bogan, V. Funk, C. Kelloff, M. Hoff., G.Cremers & C. Feuillet (eds. ), Checklist of Plants of theGuianas (Guyana, Surinam, French Guiana), 2nd. edition, ca. pp. 5. Georgetown, Guyana. 81. P. Franco-R. & C.C. Berg, 1997. Distributional patterns ofCecropia (Cecropiaceae), a panbiographic analysis.Caldasia 19(1/2): 285-296. 82. Berg, C.C. 1998. Moraceae (excl. Ficus). In G. Harling &L. Andersson (eds. ), Flora ofEcuador 60, pp. 128. Arlöv. 83. Berg, C.C. 1998. Cecropiaceae. In P.E. Berry, B.K. Holst &K. Yatskievych (eds. ), Flora of theVenezuelan Guayana,Vol. 4 (Caesalpiniaceae-Ericaceae): 174-190. St. Louis. 84. Berg, C.C. 1998. Phytogeography, systematics anddiversification of African Moraceae compared with those ofother tropical areas. In C.R. Huxley, J.M. Lock, and D.F. Cutler (eds. ), Chorology, taxonomy and ecology of the floras of Africa and Madagascar: 131-148. Kew. 85. Berg, C.C. & M.E.E. Hijman 1999. The genus Dorstenia(Moraceae). Ilicifolia 2: 1-211. 86. Berg, C.C., Luiz Emygdio de Mello Filho & J.P.P. Carauta1999. Ficus mariae (Moraceae), nova espécie Sul-Americana. Bradea 7(20): 111-113. 87. Berg, C.C. 1999. Cecropiaceae. In P.M. Jørgensen & S. León-Yánez (eds. ), Catalogue of the vascular plants ofEcuador: 390-392. St. Louis. 88. Berg, C.C. 1999. Moraceae. In P.M. Jørgensen & S. León- Yánez (eds. ), Catalogue of the vascular plants of Ecuador:604-611. St. Louis. 89. 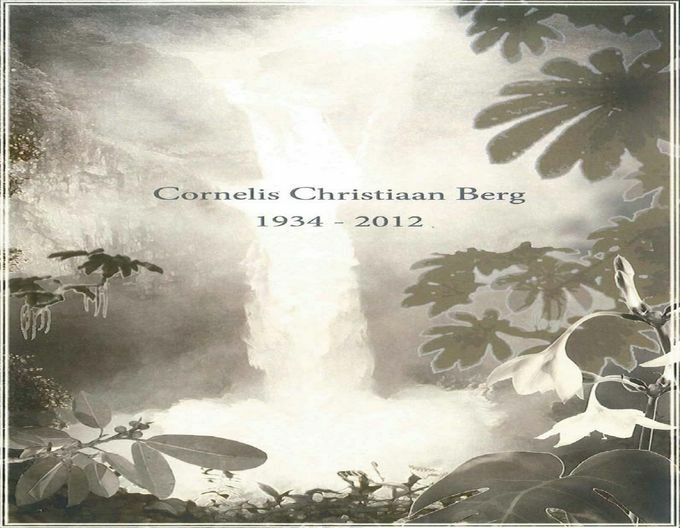 Berg, C.C. 1999. A new species of Ficus (Moraceae) from Bolivia and Peru. Brittonia 51(3): 395-397. 90. Ribeiro, J.E.L.S. & C.C. Berg 1999. Ulmaceae. In J.E.L.SRibeiro et al., Flora da Reserva Ducke: 195. INPA, Manaus. 91. Ribeiro, J.E.L.S. & C.C. Berg 1999. Moraceae. In J.E.L.SRibeiro et al., Flora da Reserva Ducke: 196-209. INPA,Manaus. 92. Ribeiro, J.E.L.S. & C.C. Berg 1999. Cecropiaceae. InJ.E.L.S Ribeiro et al., Flora da Reserva Ducke: 210-217.INPA, Manaus. 93. Berg, C.C. & J.E. Simonis 2000. Flora de Venezuela: Moraceae: 5-189 (indices: 250-269). Fundación Instituto Botánico de Venezuela "Dr. Tobias Lasser", Caracas. 94. Berg, C.C. 2000. Flora de Venezuela: Cecropiaceae: 191-249 (indices: 250-269). Fundación Instituto Botánico de Venezuela "Dr. Tobias Lasser", Caracas. 95. Berg, C.C. 2000. Ficus corneriana, a new species of Ficus subg. Sycidium sect. Palaeomorphe (Moraceae) from the Solomon Islands. Blumea 45(2): 397-398. 96. Berg, C.C. & S.V. Dahlberg 2001. A revision of Celtis subg. Mertensia (Ulmaceae). Brittonia 53(1) 66-81. 97. Berg, C.C. 2001. Moraceae. In P.E. Berry, B.K. Holst &K. Yatskievych (eds. ), Flora of theVenezuelan Guayana,Vol. 6 (Liliaceae-Myrsinaceae): 693-729. St. Louis. 98. Berg, C.C. 2001. A new species of Cecropia (Cecropiaceae) from Colombia. Caldasia 23(1): 77-79. 100. Hijman, M.E.E. & C.C. Berg. 2002. Dorstenia. In U. Eggli (ed. ), Illustrated handbook of succulent plants: Dicotyledons: 314-322. Springer Verlag. 101. Berg, C.C. 2002. Ficus. In U. Eggli (ed. ), Illustrated handbook of succulent plants: Dicotyledons: 322-323. Springer Verlag. 103. Berg, C.C. 2002. Ficus baola, a new species of Ficus subgenus Urostigma section Malvanthera (Moraceae) from the Solomon Islands. Blumea 47: 315-317. 104. Berg, C.C. 2002. Cecropiaceae. In S.A. Mori et al., Guide to the Vascular plants of Central French Guiana. Mem. New York Bot. Gard. 76 (2): 194-198. 105. Berg, C.C. 2002. Moraceae. In S.A. Mori et al., Guide to the Vascular plants of Central French Guiana. Mem. New York Bot. Gard. 76 (2): 515-525. 106. Berg, C.C. 2002. Ulmaceae. In S.A. Mori et al., Guide to the Vascular plants of Central French Guiana. Mem. New York Bot. Gard. 76 (2): 720-722. 107. Berg, C.C. 2002. Urticaceae. In S.A. Mori et al., Guide to the Vascular plants of Central French Guiana. Mem. New York Bot. Gard. 76 (2): 722-724. 108. Berg, C.C. 2002. An account on the Cecropia species (Cecropiaceae) of Peru. Caldasia 24: 229-238. 109. Berg, C.C. 2003. Flora Malesiana precursor for the treatment of Moraceae 1: the main subdivisions of Ficus: the subgenera. Blumea 48: 168-178. 110. Berg, C.C. 2003. Broussonetia papyrifera (L.) L'Hér. ex Vent. In M. Brink & R.P. Escobin (eds), Plant Resources of South-Asia 17, Fibre plants: 91-95. 111. Berg, C.C. & J. P.P. Carauta 2003. New species of Ficus (Moraceae) from Brazil. Brittonia 54: 236-250. 112. Berg C.C. 2003. Flora Malesiana precursor for the treatment of Moraceae 2: Ficus subg. Pharmacosycea sect . Oreosycea. Blumea 48: 289-301. 113. Berg, C.C. 2003. (1587-1590) Proposals to conserve the names of Ficus citrifolia against F. caribea, F. maxima against F. ciliolosa, and F. americana against F . perforata (Moraceae). Taxon 52: 368-370. 114. Berg. C.C. & X. Villavicencio 2003. A new species of Ficus and a new species of Pseudolmedia (Moraceae) from Bolivia. Revista Soc. Boliv. Bot. 4(1): 75-79. 115. Berg, C.C. & X. Villavicencio 2003. El género Ficus en Bolivia. Revista Soc. Boliv. Bot. 4(1): 81--129. 116. Berg, C.C. 2003. Flora Malesiana precursor for the treatment of Moraceae 3: Ficus subgenus Ficus. Blumea 48: 529-550. 117. C.C. Berg 2003. Flora Malesiana precursor for the treatment of Moraceae 4: Ficus subgenus Synoecia. Blumea 48: 551-571. 118. Berg, C.C. 2003. Flora Malesiana precursor for the treatment of Moraceae 5: Ficus subgenus Sycidium. Blumea 48: 573-597. 120. Berg, C.C. 2004. Cecropiaceae. In N. Smith, S.A. Mori, A . Anderson, D.W. Stevenson & S.V. Heald (eds). Flowering plants of the Neotropics: 92-94. Princeton University Press, Princeton and Oxford. 121. Berg, C.C. 2004. Moraceae. In N. Smith, S.A. Mori, A . Anderson, D.W. Stevenson & S.V. Heald (eds). Flowering plants of the Neotropics: 253-256. Princeton University Press, Princeton and Oxford. 122. Berg, C.C. 2004. Ulmaceae. In N. Smith, S.A. Mori, A . Anderson, D.W. Stevenson & S.V. Heald (eds). Flowering plants of the Neotropics: 382-383. Princeton University Press, Princeton and Oxford. 123. Berg, C.C. 2004. Urticaceae. In N. Smith, S.A. Mori, A. Anderson, D.W. Stevenson & S.V. Heald (eds). Flowering plants of the Neotropics: 384-385. Princeton University Press, Princeton and Oxford. 124. Berg, C.C. 2004. Flora Malesiana precursor for the treatment of Moraceae. Errata. Blumea 49: 154. 125. Berg, C.C. 2004. Flora Malesiana precursor for the treatment of Moraceae 6: Ficus subgenus Sycomorus. Blumea 49: 155-207. 126. Berg, C.C. 2004. Two new species of Pourouma (Cecropiaceae) from South America. Brittonia 56: 255-259. 127. Berg, C.C. 2004. Flora Malesiana: additions to and corrections of the Flora Malesiana precursory papers on Ficus subg. Pharmacosycea (2), subg. Synoecia (4), subg . Sycidium (5) and subg. Sycomorus (6): Blumea 49: 461-462. 128. Berg, C.C. 2004. Flora Malesiana precursor for the treatment of Moraceae 7: Ficus subgenus Urostigma. Blumea 49: 463-480. 129. Berg C.C. & X. Villavicencio 2004. 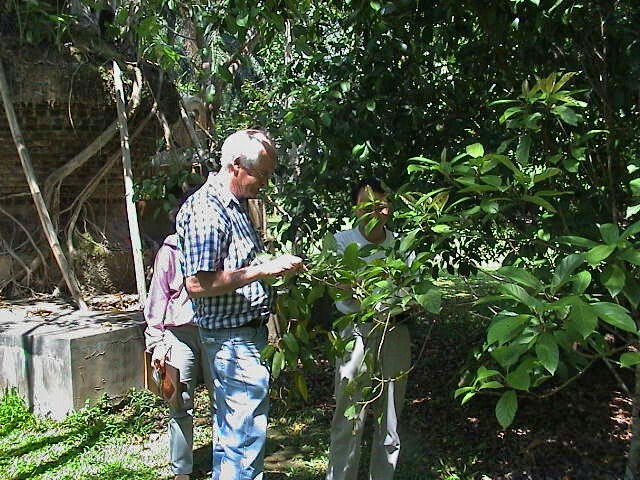 Taxonomic studies on Ficus (Moraceae) in the West Indies, extra-Amazonian Brazil, and Bolivia. Ilicifolia 5: 1-132, t. 1-45. 130. Berg C.C. & E.J.H. Corner┼ 2005. Ficus. Fl. Malesiana 17(2), pp. 730, Leiden. 131. Berg, C.C. & P. Franco Rosselli┼, with a chapter by D.W . Davidson 2005. Cecropia. Flora Neotropica Monograph 94, pp. 236, New York. 132. Berg, C.C. 2005. Moraceae diversity in global perspective. In: I. Friis & H. Balslev (eds. ), Plant diversity and complexity patterns. Local, regional and global dimensions. Biol. Skr. 55: 423-440. 133. Berg, C.C. 2005. Cecropiaceae. In: G. Staples & D.R . Herbst (eds.). A tropical garden flora: 230-231 . Honolulu. 134. Berg, C.C. 2005. Moraceae. In: G. Staples & D.R. Herbst (eds.). A tropical garden flora: 402-413. Honolulu. 135. Berg, C.C. 2005. A new species of Artocarpus (Moraceae) from Thailand. Blumea 50: 531-533. 136. Berg, C.C. 2005. Flora Malesiana precursor for the treatment of Moraceae: 8: other genera than Ficus. Blumea 50: 535-550. 137. Berg, C.C. 2006. 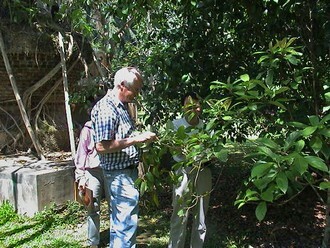 The subdivision of Ficus subgenus Pharmacosycea section Pharmacosycea (Moraceae). Blumea 51: 147-151. 138. Berg, C.C. 2006. Cecropiaceae. In: A. Akoègninou, W.J . van der Burg & L.J.G. van der Maesen (eds.). Flore analytique du Benín: 458-459. Cotonou & Wageningen. 139. Berg, C.C. 2006. Moraceae. In: A. Akoègninou, W.J . van der Burg & L.J.G. van der Maesen (eds.). Flore analytique du Benín: 806-817. Cotonou & Wageningen. 140. Berg, C.C., E.J.H. Corner┼ & F. M. Jarrett, Moraceae - other than Ficus, Fl. Malesiana 17(1), pp. 152. Leiden. 141. Berg, C.C. 2007. Precursory taxonomic studies on Ficus (Moraceae) for the Flora of Thailand. Thai For. Bull . (Bot.) 35: 4-28, t. 1-4. 142. Berg, C.C. 2007. Leaf dimorphy in Ficus binnendijkii and Ficus maclellandii (Moraceae) and the identity of ornamental trees known under the name "F. longifolia" . Thai For. Bull. (Bot.) 35:29-30, t. 1. 143. Berg C.C. & S. Gardner. 2007. A new species of Ficus subg. Ficus (Moraceae) from Thailand and two new records of Ficus species. Thail For Bull. (Bot.) 35: 31-33, t. 1. 144. Berg, C.C. 2007. Two New Guinean Ficus species (Moraceae: one new and the other with an emended description. Blumea 52: 291-294, t. 1. 145. Berg C.C. 2007. Proposal for treating four species complexes in Ficus subgenus Urostigma section Americanae (Moraceae). Blumea 52: 295-312, maps 1-3. 146. Berg, C.C. & B. Chantarasuwan 2007. A study on the taxonomy of some stoloniflorous species of Ficus subsection Sycocarpus (Moraceae) in Thailand and Malesia . Blumea 52: 313-326, t. 1. 147. Berg, C.C. 2007. 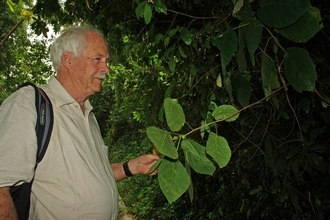 New Species of Ficus (Moraceae) from South America. Blumea 52: 569-594, t. 1-14. 149. Berg, C.C. Cecropiaceae. In: Omaira Hokche, Paul E. Berry & Otto Huber, Nuevo Catálogo de la flora vascular deVenezuela: 319-321. Caracas. Venezuela. P01. Berg, C.C. 1988. The Norwegian Arboretum at Milde.Newsletter European ‑ Mediterranean Division of I.A.B.G.No. 9: 15‑16 + backcover. P02. De vele gezichten van de tuin, pp. 17‑25 ‑ As co‑author ‑. In: In Botanische tuinen. Een bijzondere wereld aanplanten. (Botanische Tuinen Utrecht 350 jaar ‑ (1639‑1989). 1989. Ede/Antwerpen. P03. Berg, C.C. 1998. "Slangeved" - en "løvetann" blant neotropiske trær. Årringen 2: 87-92. Store Milde. P04. Berg, C.C. 1999. Ficus - mer enn bare en stor slekt . Årringen 3: 83-92. Store Milde. P05. Berg, C.C. 2000. Moraceae. Dendroflora 14-19. - On citation of neotropical collections - Brittonia <<--?? - Moraceae, Cecropiaceae, Ulmaceae, Urticaceae - Florula Mato Grosso (4X).